A very different and interesting visit on open house weekend was to Custom House. Not only for the architecture of the beautiful Georgian building but also to learn more about the activities of collecting custom and excise duty and protecting what is permissible to enter the country. Actually what was more interesting is what is not permissible. 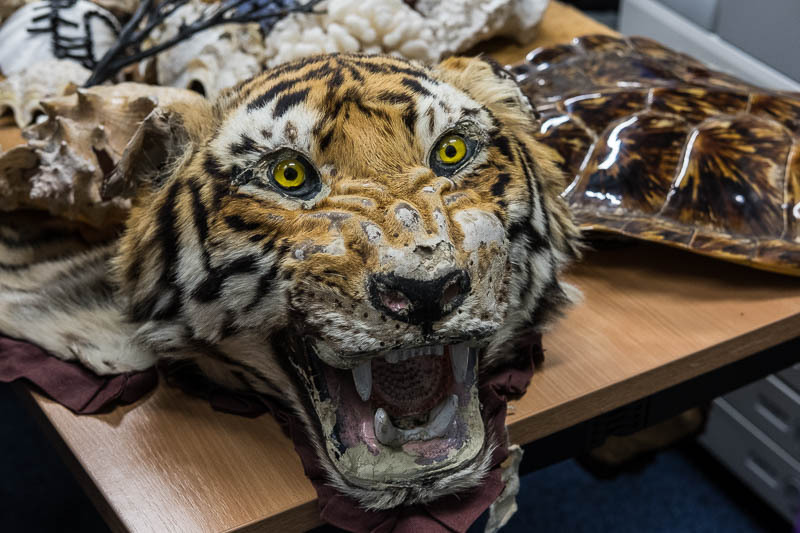 One room had a selection of goods that had been seized such as this tiger. I am stunned at what people try and smuggle in to the country. Huge elephant tusks, wolves, bears, all manner of reptiles, plus the usual drugs, alcohol and tobacco products. The methods of smuggling were revealed to us as was the means of how Her Majesties officers (and dogs) investigate and capture those involved. The dogs demonstrated their skill in finding a suitcase with hidden cocaine, and all for a reward of a tennis ball to play with! If you haven't already visited Custom House I'd absolutely recommend putting this one on your open house visit next year. A dead tiger is always useful I'd say. Fascinating - and how clever dogs can be. It is great fun for the dogs! Baffling as to how in this day and age trophy smuggling is still acceptable in some quarters. Good that the customs people are onto them. Always sad seeing a trophy animal like this.